As an extra bonus, the Drain Dawg™ is furnished complete with a tire valve stem chuck. 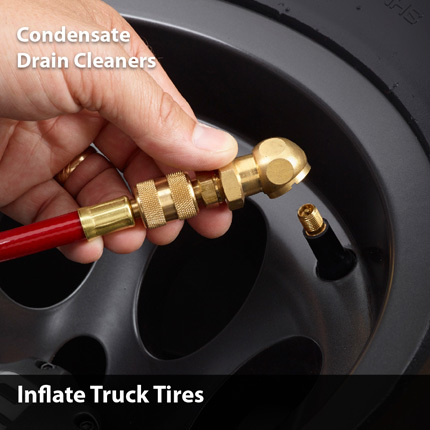 Never get caught again with a flat tire on your service truck. 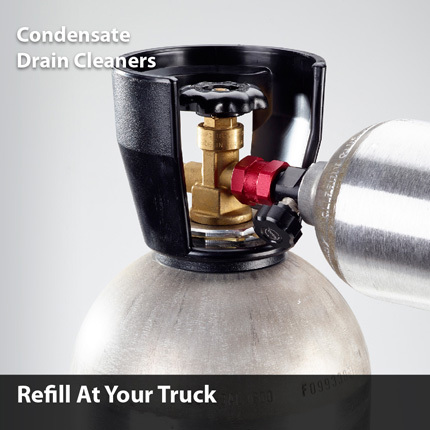 Just use you nitrogen cylinder and the Drain Dawg™ to refill your truck tire. Both the Drain Dawg™ and the Drain Kat™ feature an industry leading brass piston regulator with internal bleed down safety. 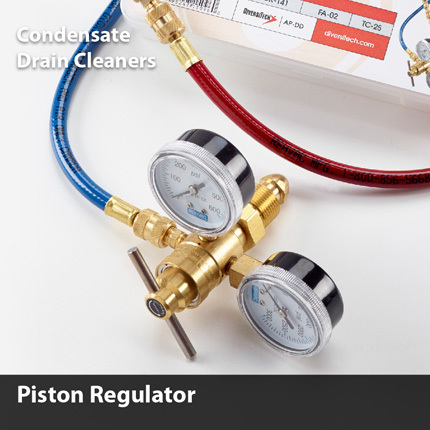 The piston regulator lasts 3X as long as a less expensive diaphragm regulator. The Drain Kat™ includes an integral on-off valve to control gas flow. Distributors can lock in the replacement cartridge business. 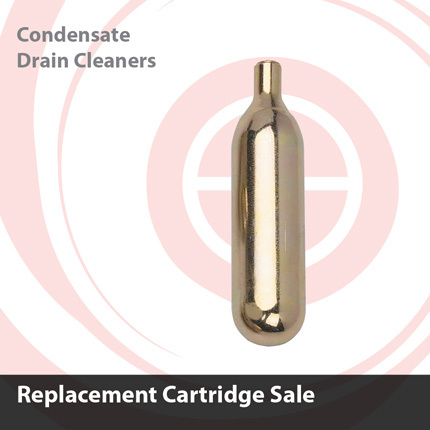 Contractors must buy replacement cartridges for the Drain Gun from wholesalers. 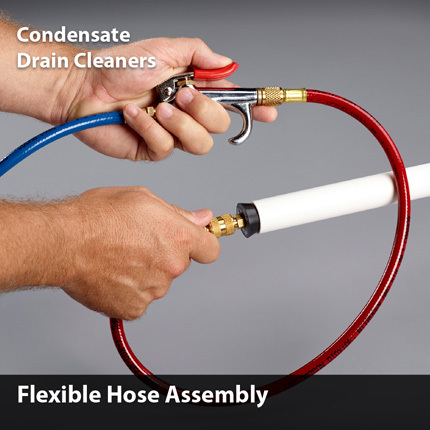 The flexible hose assembly enables you to maneuver through cabinets, coils, and hard to reach drains. The Drain Dawg™ comes complete with a 10' hose - twice the length of competing products. This longer hose gives you greater flexibility on the job-site. The Drain Kat™ weighs less than 7 pounds, and even includes a free shoulder strap. 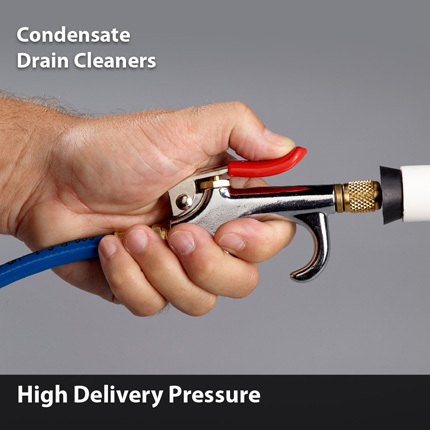 The Drain Gun packs cleaning power into a small, lightweight package that fits into your hand. 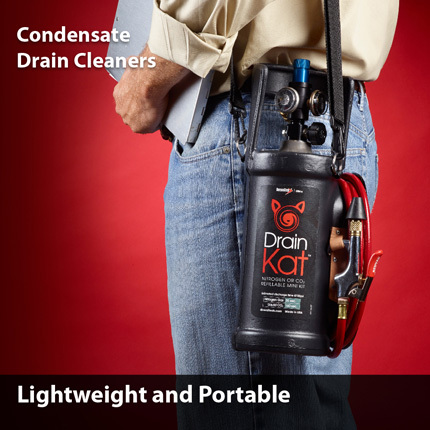 Both Drain Kat™ and Drain Gun™ give you lightweight alternatives to carrying 40 pound nitrogen tanks. Drain Dawg™ and Drain Kat™ can be used for many job-site tasks. With a nitrogen fill, you can purge and pressure test copper tube, calibrate pressure controls, clean condensate lines, clean coils, inflate tires, operate air powered tools, and cleanout oil burner lines. 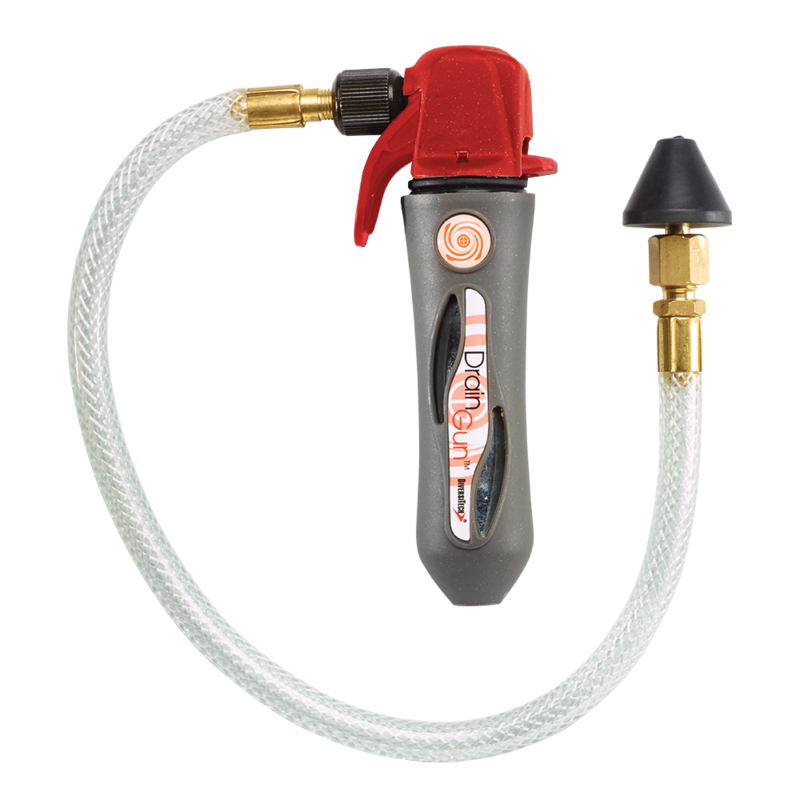 With a CO2 fill you can do everything you do with nitrogen except purge and test copper tube or calibrate pressure controls. CO2 should never be used inside the refrigerant pipework. 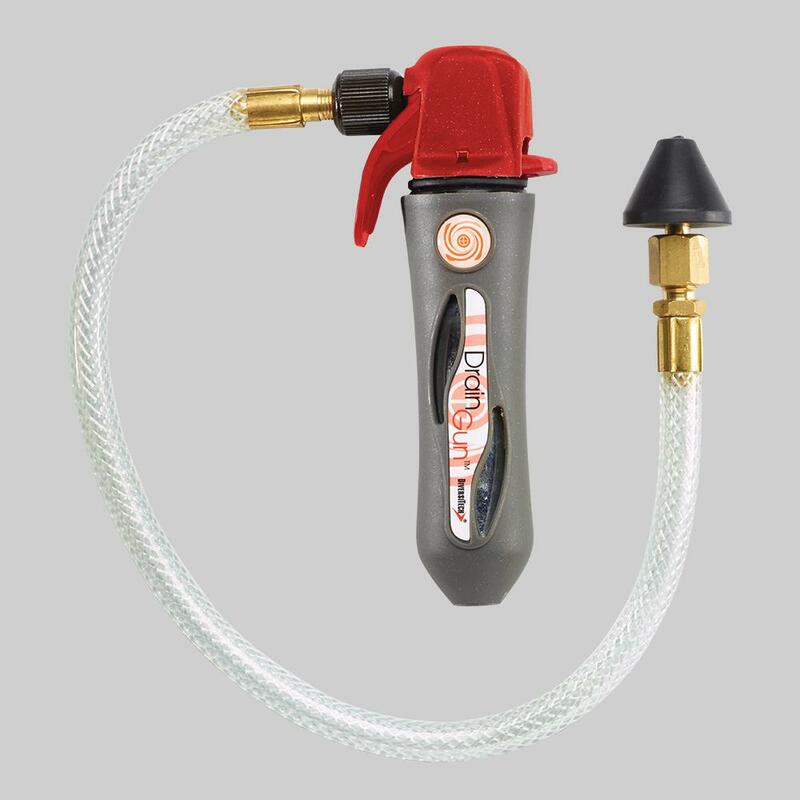 The Drain Dawg™ can supply up to 475psi, the Drain Kat™ can supply up to 250 psi, and the Drain Gun™ up to 800psi. 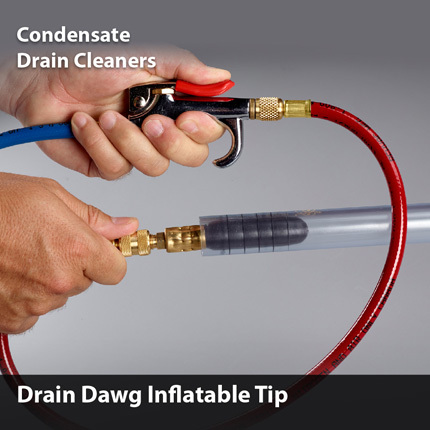 Use the Drain Dawg™ when you need a continuous supply of nitrogen or CO2, Drain Kat™ when you need the a small portable 2-1/2 pound cylinder, and Drain Gun™ when you need the ultimate in hand held power. The Drain Kat™ can be easily refilled at your service truck with either nitrogen or CO2. 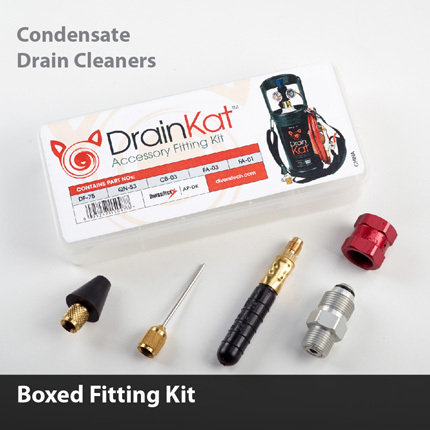 Adapters and fittings are included with Drain Kat™. Stop lugging heavy cylinders around the job-site, use the 2-1/2 pound refillable cylinder in the Drain Kat™. A simple plastic compartmented box is supplied with each Drain Dawg™ and Drain Kat™. This box contains all of the adapters, fittings, and nozzles that you need for maximum effectiveness. Drain Dawg™ and Drain Kat™ both come complete with the unique Drain Dawg™ inflatable tip. This tip fits 3/4" or 1" drain pipes and once charged with nitrogen or CO2, expands and seals against the inside wall of the pipe, directing pressure discharge down the pipe to blow out any clog. 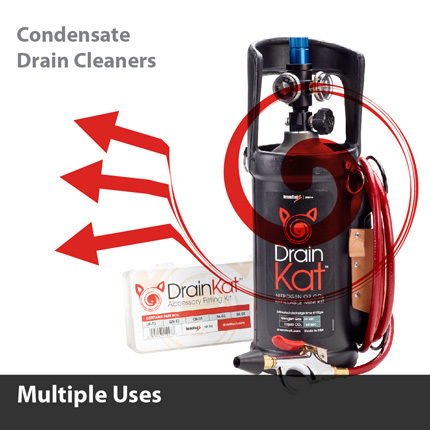 Both the Drain Kat™ and the Drain Dawg™ can be used with either nitrogen or CO2. 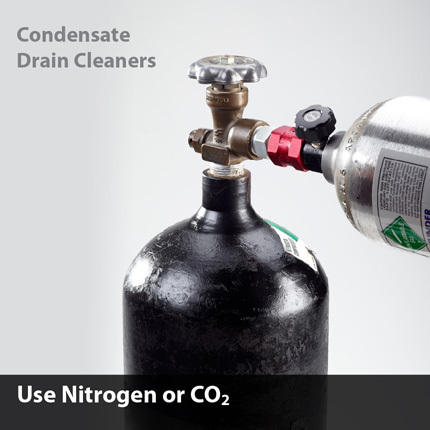 Nitrogen is easy to fill and commonly available, while a CO2 cylinder will last longer. The Drain Gun should be used only with DiversiTech brand CO2 cartridges.